The Omni Double Sided Exhibition Tape is a synthetic cloth-based tape that comes with strong adhesive to be used for temporary application on displays, signage, carpets, exhibition equipment etc. The tape has been designed specifically for securing items on walls or on the floor for showcasing them in events. Being fabric-based, it is not easy to tear, which gives it the kind of strength you are looking for in a tape used for fixing and fastening items on display. The rubber-based adhesive used in the tape is perfect for exhibition floor covering since it can be easily removed from the floor as well as from the item it is applied on (carpet, rug, painting, art piece etc.) without leaving any residue behind. Used extensively for trade shows and exhibitions, this double sided tape is extremely easy to apply and can fix items within minutes. 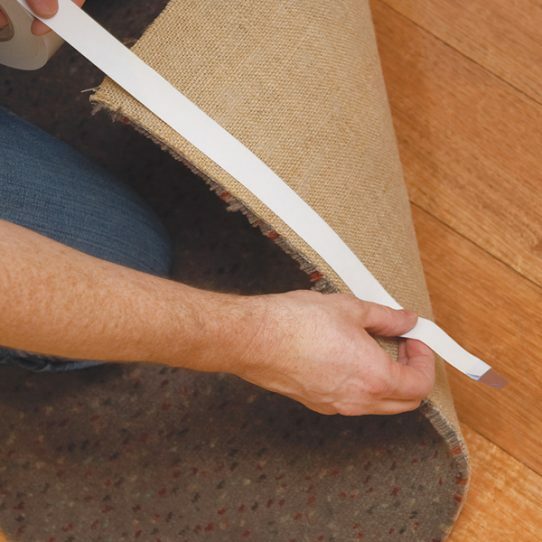 Besides commercial use, the tape is also used in households for fixing carpets to the floor so that it doesn’t budge and stays secured in the correct place. Being cloth-based, it can be easily used on both smooth and uneven surfaces. In view of the different requirements of our customers, we also offer exhibition tapes of various sizes.